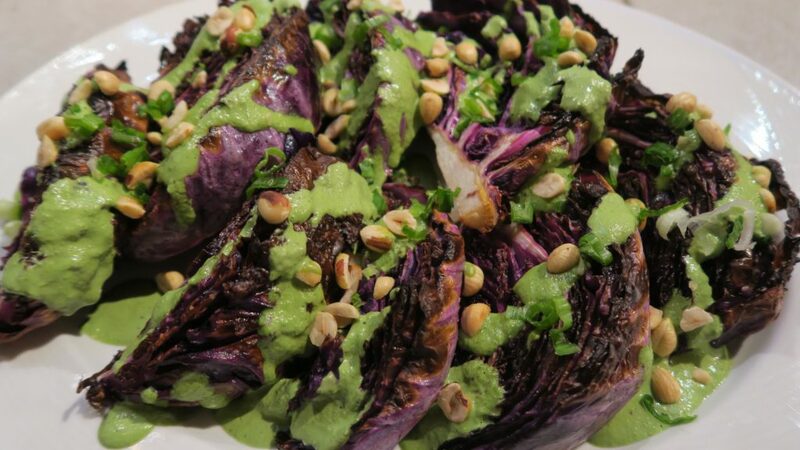 In this recipe, purple cabbage is roasted in the oven, then dressed with a refreshing mixture of basil and tahini, and topped with crunchy, smoky hazelnuts. Flavorful and elegant, it is also good for you! Chop the head of cabbage in quarters, leaving the core intact as that’s what will hold it all together. If you can get more slices out of it while still keeping the core, go for it. Lay slices down onto baking sheet on a flat side, drizzle olive oil, and coat both sides of each slice with some. Sprinkle sea salt over top and roast for approximately 25-30 minutes, flipping halfway through. In the meantime, make the basil dressing by adding all ingredients to a food processor, and set aside. Take a handful of hazelnuts and lay on a baking sheet, roast in the same oven for 3 minutes or so—watching them carefully so they don’t burn. The outer layer will be cracking off and you can remove it after it cools off with a paper towel. Chop hazelnuts in half and set aside for topping. Once cabbage is done, using tongs, add to your plate. Drizzle basil dressing, top with any leftover chives and hazelnuts. Serve. Note: If you prefer your roasted vegetables on the crispy side, let the cabbage cook slightly longer. The crispy leaves taste great!